Liza Orlova is running a new Women’s Chess Club at Annex. The club is open to women and girls age 12 and up. Liza wants to help women learn chess not just to play the game, but to benefit from it in many aspects of their lives. The club meets from 7:20 to 8:20 on Monday nights in a room of their own at 918 Bathurst. The club features chess lessons and games for women and girls at either a beginner or an intermediate level. Brand new players will start at the very beginning with how the pieces move, and more advanced players will work on understanding strategies and tactics. Join the club for a course of seven one-hour sessions from March 13 to May 1 for $140. Register on site March 13. If you’re not sure whether chess is something you want to learn or whether the course is a good fit, go ahead and take the class on a trial basis – there’ll be no charge if you decide not to continue. Many girls stop playing chess in high school. Either it’s not cool in the opinion of their peers – or they fear it won’t be – or boys’ behaviour in and around the game becomes unappealing. There’s a lot of judgement in high school; everyone is constantly judging others and intensely aware of being judged. Despite her previous success with chess and much to her later regret, Liza found herself in a place where she thought that if she were known as a chess champion, it would be seen as a bad thing. She kept it a secret as much as possible and quit playing for over a year. Many boys and men quit chess too at one point or another, but usually for different reasons and often to return later. For too many girls, their departure is permanent. It’s a problem that begets itself. The girls who do continue with chess often look around in a tournament hall full of players and see they’re the only woman there – or at most they see just one or two others. No wonder they start to feel out of place! Then, as the previous generation matures, girls coming up in the next cohort have few female role models among their chess teachers. And it’s not just a problem for the girls: boys too are deprived of the opportunity to see women in this role. Many moms support and encourage their kids to learn the game, but when these kids come home from their lessons, in many cases only their dads can understand what they’ve learned or help with their homework. Combined with other factors, it can be hard for girls to stick with an activity they can’t see their mothers doing. How can you benefit from taking these chess classes? The Women’s Chess Club invites new players to learn chess for the first time and former players to come back to a game they once loved. Liza is a young and talented chess professional, an experienced teacher, and a popular coach. As a player, she has won many championship titles and has represented Canada in the Chess Olympiad. The woman in the featured image is Tania Sachdev, a top female player from India. Her mom taught her the game when she was six. Liza Orlova, member of the Canadian Women’s Olympiad team and former ACC kids’ instructor, is going to be playing in the Reykjavik Open, February 19 to 27. She has also recently posted a new analysis video on YouTube. Follow her tournament blog updates by liking her facebook page. Sanctioned by the GTCL, which represents Greater Toronto in the Ontario Chess Association, this is a six-player round-robin tournament, featuring the top Toronto female chess players who applied. It will be played on Monday nights at Annex Chess Club, 918 Bathurst, from October 15 to December 3. Zhanna Sametova wins the tournament! Even though Rebecca Giblon has tied her at 4.0/5, Zhanna wins the head-to-head tie-break. 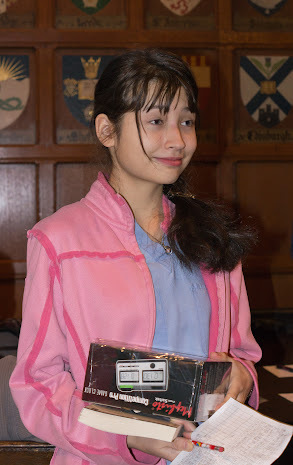 Congratulations, Zhanna, you are the 2012 Toronto Women’s Chess Champion! Rd 1 (Oct 15): 1-6, 2-5, 3-4. Rd 2 (Oct 22): 6-4, 5-3, 1-2. Rd 3 (Oct 29): 2-6, 3-1, 4-5. Rd 4 (Nov 5): 6-5, 1-4, 2-3. Rd 5 (Nov 19): 3-6, 4-2, 5-1. Alex has posted games on Chess5. The Toronto Women’s and Junior Championships closing ceremony will take place at Hart House during Winter Open – on Saturday, January 5, just before round 3 – at 3:50 pm. All Toronto Women’s and Junior Championships participants will get book prizes donated by our perennial sponsor – Mr. J. Ken MacDonald. Annex Chess Club is pleased to host the 2011 Canadian Women’s Chess Championship. WIM Natalia Khoudgarian is the new Canadian Women’s Champion – see the results page. This event is sanctioned by the Chess Federation of Canada (CFC). The winner will become the Canadian Women’s Champion, and will earn a place on the 2012 Olympiad Women’s Team. The event will also raise funds for the 2012 Olympiad Women’s Team. All players must be up-to-date CFC members. The tournament will also be FIDE rated. We are pleased to announce an additional prize, as follows: $250 to be shared among all players with a perfect score of 6/6. There has never been a perfect score in the Canadian Women’s Championship! A Chess Institute of Canada camera crew will be on site, Monday October 10, filming for a video on chess in Toronto. By registering for the tournament, you are giving permission to appear in this film unless you indicate otherwise on your registration. If you do not wish to take part in the film, please inform the organizers on your registration form, and you will be seated so your game is not on camera. 4 Iulia Lacau-Rodean 144348 OK 1994 1211285 2008 women’s Olympiad team 2010 poss. 5 Liza Orlova 138247 OK 1994 2601826 1931 WCM women’s Olympiad team 2010 poss.